People on the deathbed often have many regrets. The greatest of such regrets center on, “If only I had done this …”. However, we live in a world of uncertainty. Leave alone success, even survival isn’t a certainty – we may not be alive tomorrow. By demanding certainty of success as a precondition for endeavor, the mind sentences us to the certainty of failure: if nothing is sought, nothing is got. Our mind is, of course, a champion at dreaming – it’s like a child with an overactive imagination. 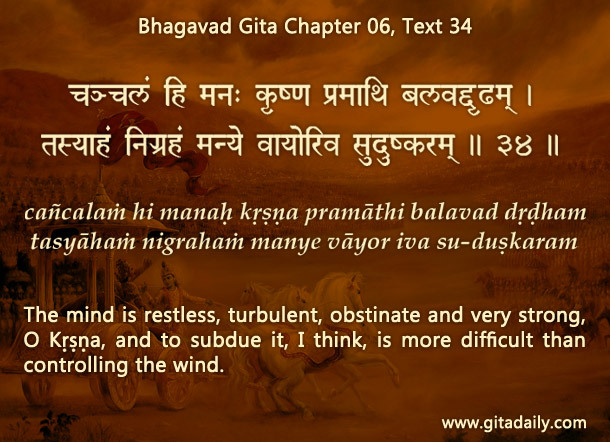 However, when it comes to working for actualizing any dream, it exhibits another childish trait: restlessness (Bhagavad-gita 06.34). It keeps flitting over a hundred things, committing to hardly anything and achieving nothing. How can we prevent the mind from sabotaging our dreams? By raising our vision above the uncertain material level to the spiritual level. We are souls, parts of the supreme spiritual being, Krishna. He has gifted all of us with certain potentials. If we connect with Krishna by practicing bhakti-yoga, we start tuning in to his empowering voice, thereby transcending and muting the mind’s discouraging voice. Being guided by him, we start striving to manifest our potentials in a mood of contribution. When we thus live for Krishna, he enriches our heart with his divine presence. Being thus enriched, by the end of our lives, even if some specific dreams aren’t fulfilled, we will still be fulfilled. How does the mind sentence us to failure? How can we transcend the mind’s discouraging voice? Even when our dreams aren’t fulfilled, how can we be fulfilled? Prabhu ji, thank you so much for such a powerful and deep article. Now, I am aware why I am not pursuing my dream?? does God listen to pur prayers or its just for a mental peace ?